I used to do lots of beading when I was younger, but it’s something that I haven’t explored for a while. 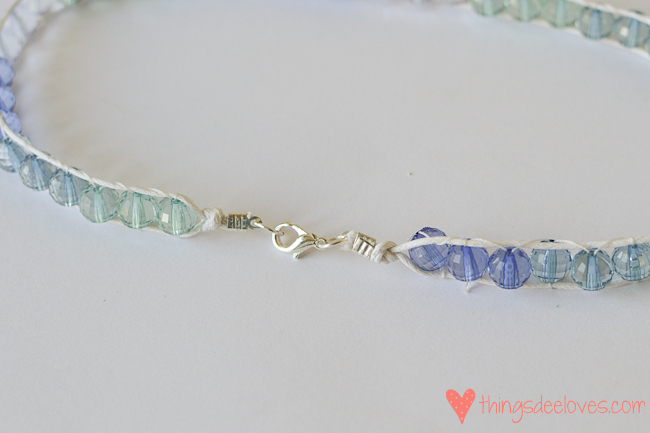 I was recently inspired by some beaded bracelets on Pinterest, so I decided to try to make a Summery wrapped beaded bracelet. I popped off to a nearby Chinese shop, which had rows and rows of plastic beads in beautiful colours, and I had a ball choosing beads in co-ordinating hues. I eventually settled on some pretty blues and greens. Firstly, measure how much cord you’ll need to wrap twice around your wrist, and add an extra 10-20cm. Cut another piece of cord the same length. Also cut a long piece of thread (about twice the length of the cord). Hold the three strands together at one end (two strand of cord with the single strand of thread), and tie them into a knot. Attach one of the clamps, using the pliers, and cut off any excess. 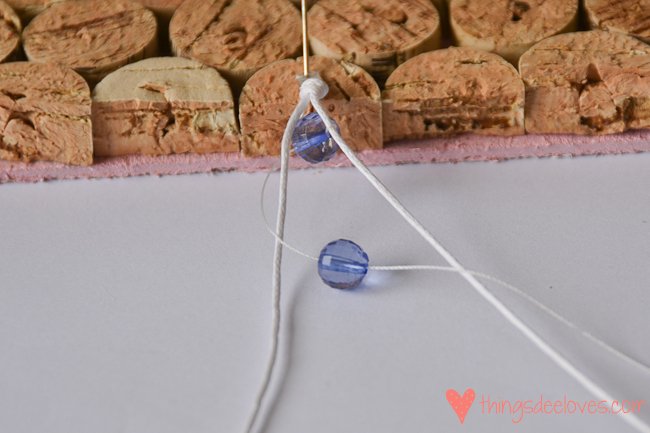 Use a pin through the loop of the clamp to attach the end to a cork board (or use a clip board if preferred). Thread the needle onto the thread, and thread on your first bead. Push the bead up against the knot. Now loop the thread around the right-hand cord, back through the bead, and loop around the left-hand cord. Thread another bead onto the needle, and repeat. Keep adding beads in the same manner, changing the colours as you wish. If the threading process doesn’t make sense, this diagram may be helpful. 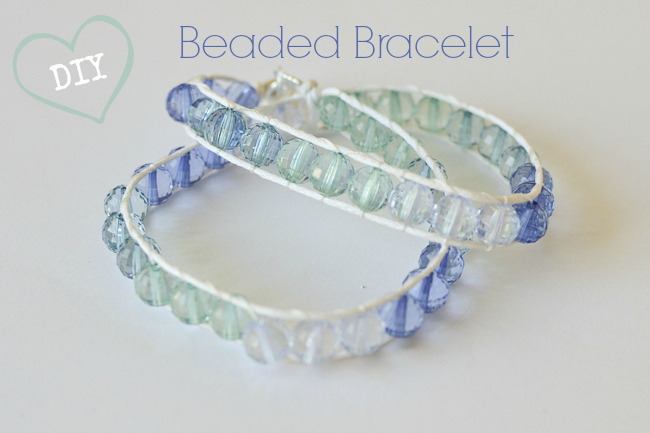 It may also help to double-back through the same bead occasionally, which will stabilize the bracelet. It can be a bit fiddly initially, but it get’s easier as you go along. 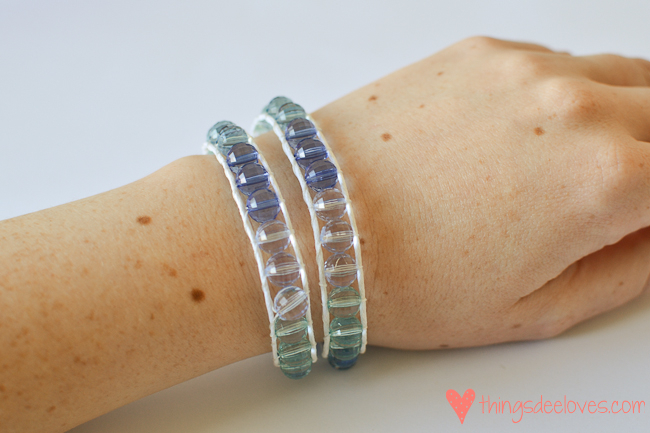 Once you bracelet is long enough, tie the three strands together and add a clamp. Finish off by adding a jump ring and clasp to the clamps. Your awesome. Ez instructions made it the first time..